Chinese New Year 2016 is on Monday 8 February. The date of Chinese New Year is based on the Chinese lunar calendar, not the Gregorian calendar, but is always somewhere in the period from January 21 to February 20. Read more on Chinese New Year dates from 2016 to 2027. In 2016, most Chinese will be off work 7 days from Sunday, February 7 (New Year's Eve) to Saturday, February 13 (Chinese New Year day 6). China Highlights’ office will be closed during this period, and we will be back at work on Sunday, February 14, though you can still reach our 24/7 hotline numbers. 2016 — a Monkey Year: Watch Out "Monkeys"! 2016 is a year of the Monkey according to the Chinese 12-year animal zodiaccycle. Other Monkey years include: …1944, 1956, 1968, 1980, 1992, 2004… If you were born then you’re a Monkey. Each Chinese zodiac year begins on Chinese New Year's Day. Monkey years are believed to be the most unlucky for people born in a year of the Monkey. Read more on Monkeys' Fortune, Career, Health, and Love Prospects in 2016. Why Do People Celebrate Chinese New Year? 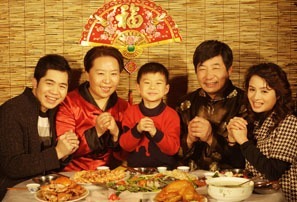 The main traditional celebrations of the festival include eating reunion dinner with family, giving red envelopes, firecrackers, new clothes, and decorations. More modern celebrations include watching the CCTV Gala, instant message greetings, and cyber money gifts. A Festival for Family – Chinese get together and enjoy family time. The New Year's Eve dinner is called "reunion dinner", and is believed to be the most important meal of the year. Big families of several generations sit around round tables and enjoy the food and time together. 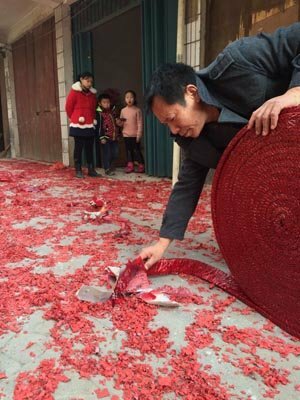 Every street, building, and house where CNY is celebrated is decorated with red. Red is the main color for the festival, as it is believed to be an auspicious color. Red lanterns hang in streets; red couplets are pasted on doors; banks and official buildings are decorated with red New Year pictures depicting images of prosperity. Most of the decoration is traditionally done on Chinese New Year’s Eve. As 2016 is the year of monkey, decorations related to monkeys will be commonly seen. There are red monkey dolls for children and New Year paintings with monkeys on. Find more on Chinese New Year Decorations. Many cultural activities are arranged during the festival. 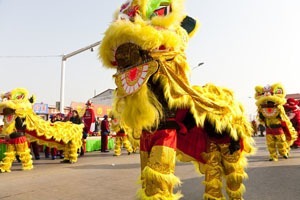 Rural areas and small towns retain more traditional celebrations than the cities, such as setting off firecrackers, ancestor worship, and dragon dances. Setting off fireworks is common during the Spring Festival season all over China. At temple fairs in many Chinese cities traditional performances can be seen: dragon dances, lion dances, and imperial performances like an emperor's wedding. A great variety of traditional Chinese products are on offer there, and strange Chinese snacks, rarely seen the rest of the year. Beijing's temple fairsare held in parks from the first day of the lunar year to the Lantern Festival. In North China people perform various versions of the Rice Sprout Song, a traditional Chinese dance performed by a group of colorfully-dressed women and men. 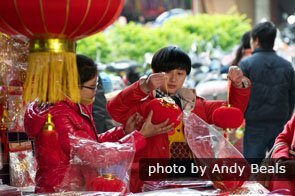 Like Christmas in the West, people exchange gifts during the Spring Festival. The most common gifts are red envelopes. Red envelopes have money in, and are given to children and (retired) seniors. It is not a customs to give red envelopes to (working) adults, except by employers. 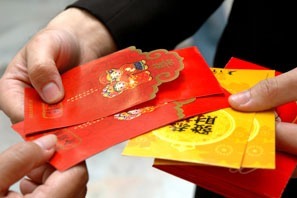 Red envelopes are used in the hope of giving good luck (as well as money) to the receivers. Read more on Who You Should Give Red Envelopes to and How Much to Give. Certain foods are eaten during the festival (especially at the New Year’s Eve dinner) because of their symbolic meanings, based on their names or appearances. Fish is a must for Chinese New Year as the Chinese word for fish sounds like the word for surplus. Eating fish is believed to bring a surplus of money and good luck in the coming year. Other Chinese New Year foods include dumplings, spring rolls, glutinous rice cakes, and sweet rice balls. Setting off Firecrackers — "Goodbye Old Year; Welcome New Year!" It has long been a Chinese tradition to set off firecrackers when the New Year clock strikes. The tradition is to set off one string of small firecrackers first, followed by three big firecrackers, which symbolize "sounding out" the old year and "sounding in" the new year. The louder the three firecrackers, the better and luckier it’s believed it will be for business and farming in the coming year. Praying in a temple during Chinese New Year is said to be a particularly blessed activity, and will lead to a smooth coming year. In Shanghai, China's biggest city, thousands flock to Longhua Temple, the city's biggest temple, to pray for good fortune. 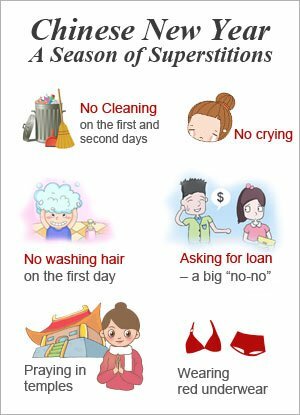 As Chinese people believe that the year’s start affects the whole year, are many superstitions and taboos for the Spring Festival season. These taboos usually apply up to a month before the festival and continue to the end of the festival (day 15, the Lantern Festival). Some Chinese people believe that they mustn't do cleaning or wash their hair in the first three days as that will sweep/wash away good luck. A cry of a child is believed to bring bad luck to the family, so the young are placated fastidiously. No begging: To ask for a loan is a big "no-no". You will see red underwear sold at supermarkets and street markets. Red is believed to ward off bad luck and misfortune. For people born in a year of the Monkey, red underwear is a must for 2016! Find all the details at Things You Should Not Do During Chinese New Year. Chinese New Year celebrations and activities are changing. A change in attitude to the festival has occurred especially among China’s younger generation. Most young people prefer surfing the Internet, playing with smart phones, and sleepovers or spending time with friends to celebrating with their extended families. Sending cell phone messages had become the main way to greet people on Chinese New Year's Eve this decade. In the past people sent New Year cards or called each other to express their good wishes during the Spring Festival. Now more people use instant messages on WeChat (the most popular social media app in China, like WhatsApp and Facebook Messenger in the West) to greet their friends. Read more on Popular Chinese New Year Greetings. App-sent/received "red envelopes" appeared in 2015, and they soon become the most popular New Year activity among the young. Many young people spend most of their 2015 New Year holiday time exchanging cyber money via red envelope apps for fun. Tough Time for "Old" Singles — Solution: Fake Boy/Girlfriend Rental! Chinese New Year is a joyful time for most, but for singles above the normal matrimonial age it is not so. Parents and relatives think they should be settled down. In China, females are said to be marriageable up to 30, and males before 32. Those who don't get married before these ages are thought to be the dregs of society! For these singles, parents are extremely anxious. So New Year's Eve stress is heightened by embarrassing interrogations of the singles. Desperate parents even arrange dating (prospective marriages) for their single children. To solve this problem an interesting, and often ridiculous, solution has appeared — renting a boyfriend or girlfriend for the New Year. There are websites and agents specialized in this business. Taobao, China's largest online retailer, has a section for fake boyfriend and girlfriend rentals. The price is about 100 yuan (16 USD) a day. The Chinese New Year period is a good time to visit China if you are interested in traditional Chinese culture. But you should be prepared for travel chaos and transport stress around China. It seems the whole nation is on the move during the festival. The festival is the busiest travel season in the world, when trains and buses are fully packed. Even flight tickets can be hard to get. 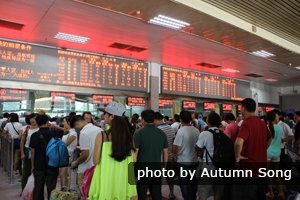 Chinese people do whatever they can to go home to see their families: from buying a ticket from scalpers at several times the price, to queuing for three days, to fighting for a ticket, to standing for more than 20 hours in an over-packed train, or riding a bus with 20 extra passengers on stools down the aisle for 12 hours or more. China's migrant workers are the main force during this migration. They carry large and heavy bags full of their worldly possessions and gifts, traveling generally from China's richer east coast back to their hometowns. If you are in China during 2016’s Chinese New Year period, the following table will be useful to you. See when transport is most crowded, when it improves, when there are lots of fireworks, when banks and government offices are open, when shops re-open, greetings and customs, etc. No bank or government office is open. Only big shopping malls are open. Almost no bank or government office is open. Only big shopping malls are open. Local travel and town and village buses are busy, but travel to other cities and domestic flights are ok. Some banks and government offices are open, but business is limited and hours are much shorter. Only some big shopping malls are open. The statutory holiday period is over. Some people will keep visiting friends and relatives; some will go back to work. Most banks and government offices will be open, but business is limited and hours are shorter. Most shops will be open. For most it’s the first day back at work. Some shops, companies, and offices will reopen on this day, because 6 is a lucky number in Chinese culture. Some businesses may choose CNY day 8 (February 15) to reopen, as 8 is also a lucky number. The non-superstitious may reopen on day 7 (February 14).